• Consisting of what we can only deem as “Mickey Mouse” sized apartments: the 4-bedders are less than 1300sqft, unless you opt for the penthouses. This was despite the fact that CENTRO RESIDENCES is located at the heart of Ang Mo Kio Town Centre, next to AMK Hub mall and its air-conditioned bus interchange, and just across the road from Ang Mo Kio MRT station. These were the main selling points of the project. However, we seemed to be proven wrong when a total of 93 out of 144 units released in the first phase were sold within the first 3 days of preview. The good take up rate has prompted Far East to announce that they will market CENTRO RESIDENCES in phases over the next three years till the TOP of the project, so as to take full advantage of the vast potential expected for the enhancement of real estate values in the Ang Mo Kio area. They were also confident that CENTRO RESIDENCES will be fully sold before its TOP. Prices for the remaining units were further raised to about $1250psf, with one units transacted at $1289psf. So the wife and I finally decided to see for ourselves what all this hype with CENTRO RESIDENCES is about, and we made our way to the sales gallery yesterday. The sales gallery for CENTRO RESIDENCES is located on an open ground along Ang Mo Kio Ave 8 next to “Grandeur 8” (another condo), about 700m away from the actual site. 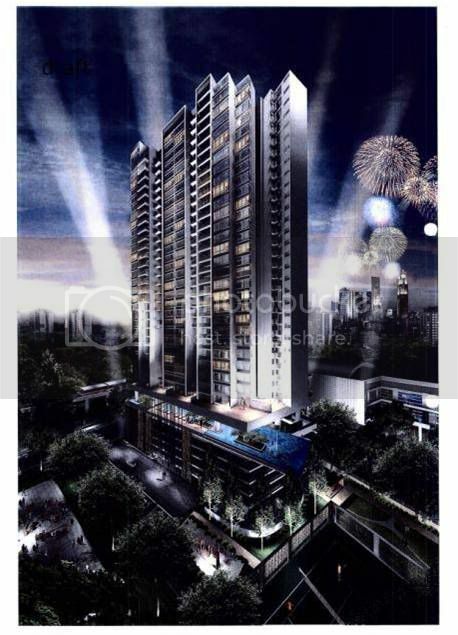 CENTRO RESIDENCES consists of 329 apartment units located within a 34-storey Tower. The land size that CENTRO RESIDENCES sits on is rather small, about 69,000sqft, which explains the high plot ratio of 4.9. The expected TOP of this project is in 2013. The apartment units actually start from the 7th floor, providing residents a panoramic view of the city skyline or the lush greenery at Ang Mo Kio Town Garden East/West parks. The Sky Villa at Level 34 offers more recreational options. You can enjoy a dip in the pool as you take in the spectacular garden and city views. In addition, there is a tennis court, a basketball half-court, fitness and children’s play areas on the ground level. The 2nd – 5th levels in the Tower are dedicated to carparks, but strangely enough, only 276 carpark lots are provided for residents of the 329 apartments. We were told that apartment units that do not want a carpark lot will get a $100 deduction from their monthly maintenance fee. There are 2 showflats in the sales gallery. The first is a 1206sqft, 3-Bedrooms unit. It comes with 2.9m high ceiling, 60x30cm marble-slab flooring for the living/dining area, and a rectangular balcony that is almost 100sqft. The common bathroom has homogenous-tiles flooring and “Ideal Standard/Remer” bathroom fittings. The wet & dry kitchens form an L-shape with each other, with a sliding glass door separating the two. Kitchen cabinets have anti-slam drawers, and kitchen appliances that come with the unit include “Teka” oven/hood/hob and “Bosch” fridge & washer/dryer. The wet kitchen area is so small that it will be quite a challenge for two people to work comfortably inside. The small yard has a tiny built-in sink – barely enough space for you to do laundry. There is also a small L-shaped utility/maid’s room that can probably accommodate a small custom-made bed but nothing much else. The master bedroom does not look small, but it will probably be a bad idea to put in a king-sized bed. It comes with an open concept wardrobe, and you can choose to have the partition wall for the master bathroom either in glass or concrete. The master bathroom has marble floors/walls, “Ideal Standard/New Form” bathroom fittings, and a tub with rain-shower. The 2 common bedrooms are square-shaped, and a little on the small side. The other showflat is what they called the “3-Bedrooms compact” unit. The unit is 904sqft, and comes with the same floors/walls furnishings and kitchen/bathroom fittings as the 3-Bedrooms unit. However, the balcony is L-shaped, and the usual small L-shaped kitchen applies. There is no utility/maid’s room & toilet and not much of a yard area to speak of, so you can probably forget about installing overhead laundry rack. The master bedroom is surprisingly quite decent sized, and you have the option of sunken bath or tub with overhead rain-shower in the master bathroom. The “normal” common bedroom is square-shaped and probably can ft a queen-sized bed if you utilize the bay window as part of your bed frame, while the other “compact” common bedroom is at almost 2/3 the size - this is probably more suited as a study or playroom. • Location – at least this is what most buyers of CENTRO RESIDENCES were sold on, and is also the biggest selling point of the project. Being centrally located within the Town Centre next to the AMK Hub, you get over 200 outlets of shopping and dining pleasures and other amenities almost right at your doorsteps. The bus interchange integrated into the shopping centre provides good transport connections around Singapore, while the MRT station opposite is a mere five stops away from Orchard (or so we were told, since the wife and I do not take the MRT much). • If you have kids going into primary 1 in 2014-2015, you may be reassured by the fact that there are at least 2 primary schools that are situated within 1-km of CENTRO RESIDENCES – Jin Shan Primary and Mayflower Primary. • Location – I know this may sound like a contradiction, but we actually think that being located right in the middle of the Town Centre and next door to a shopping mall/bus interchange/MRT is more a bane than boon. The constant flow of human traffic around you and the noise they generate is not something that we like to go home to. • The actual site of CENTRO RESIDENCES is a rather small plot of land that is stuck between the AMK Hub on one side, some HDB point-block on the other, Ang Mo Kio Ave 8 with the MRT station in front, and more HDB blocks at the back. I do not know about you, but just thinking about it makes us feel a tad claustrophobic. • The units in CENTRO RESIDENCES form a triangular shape around the tower, with an open central atrium located within (refer to stack-layout picture for better visuals). All the kitchens/yards face inwards towards the central atrium. So you are likely to get a rather dark kitchen irrespective of the time of the day, while depending on the hot air from your air-con compressors to air-dry your clothes rather than natural breeze. • Although there is no showflat for the 4-Bedrooms compact unit, we understand from the floor-plan that there is only 1 common toilet in the living room to be shared among the 3 common bedrooms. This is definitely less than ideal. • The wife and I do not fancy “Mickey Mouse” units, as they violate our human rights for individual spaces. It is inevitable given the space constraints we face in Singapore and the high property prices, more and more housing units are being built using the “Hong Kong” model. Speaking from personal experience, we have previously stayed in a 1250sqft “2+Study” unit for a couple of months. I got a rude awakening every morning from the noise that my 5yo son generated in the living room, and he woke up like at 6am everyday! So we really cannot imagine ourselves living in a 1208sqft 3-bedder, or worse, an 885sqft 2-bedder unit. • The CTE, which is the main expressway that residents with cars at CENTRAL RESIDENCES will take for access into the City/CBD area. The wife and I are always very perplexed by the traffic condition at CTE. With the AYE/PIE, one can almost anticipate the “heavy traffic” times during the day. But the CTE can be jammed up at any time of the day, even on weekends. So this makes the journey less “predictable”. • And finally, the price. At $1,250psf or more, we see little upside for a suburban 99-years leasehold project. This is irrespective of its supposedly convenient location within an established and rejuvenated estate. Not when the other full-facility condo project, “Grandeur 8”, located less than 700m down the same road, is currently selling at a price of around $800psf. One can always argue that the later is an older project, and provides different set of lifestyle living compared to CENTRO RESIDENCES. But the price gap is way too huge for potential buyers weighing the 2 options to disregard. A total of 156 units are released for sale as of yesterday. These comprise apartments from the 7th to 19th floors. Out of which, 103 units have been taken up - these are primarily the smaller 2-bedrooms and 3-bedrooms compact units. We were told that buyers were mainly HDB upgraders currently living in the Ang Mo Kio/Bishan/Yio Chu Kang area and investors seeking rentals. We were told that there may be a good demand for rental at CENTRAL RESIDENCES due to its relatively good proximity and accessibility to the City/CBD area. In addition, rental demand may be boosted by the Australian and French schools located nearby. But the wife and I are a bit sceptical about the later, as Caucasian families with school going children will probably not opt for small apartments like those found in CENTRO RESIDENCES. For those who are interested, a 904sqft 3-Bedrooms compact unit on the 17th floor (stack 4) will cost you $1.16 million after discount. This translates to about $1283psf. The monthly maintenance is a low $30/share, so expect to pay only $210/month for the 3-bedder (7 shares) or an even lower $110/month is you opt not to have a carpark lot. After our visit, the wife and I still arrived at the same conclusion… “Siow”! We expect a lot of price resistance to the exorbitant $1200-1300psf price level that Far East is currently asking for CENTRO RESIDENCES after the initial buying euphoria. And this may already be showing – it looked like only 10 additional units were sold after the first preview. 7 comments to ''CENTRO RESIDENCES (Review)"
glad i can still find info on this project ! going to top soon !! It has the like men and women 're not included until eventually it really is one thing to achieve having Rhianna! Your individual items fantastic. Everyday take care of up! I do not know who you might be but certainly you're going to a famous blogger when you are not already. Cheers! I need to claim that this informative article is awesome, awesome prepared and come with around just about all important infos. I want to glimpse excess blogposts similar to this .